I also like this method because it is impossible to get confused as to which round you are on – not even I can miss a glaring yarn over on what should be a plain knit row. I usually used m1r and m1l increases and was forever forgetting which row I was on. I do use a row counter, but often zone out and forget to click it, With such fine yarn and small needles, and middle-aged eyes, I find it hard to tell if I increased on the previous row or not. Switching to yarn over increases for my toes was a godsend. If there are yarn overs, then I’m on a knit row and just knit them through the back loop; if there are no yarn overs, then I need to yarn over. Simple! The gusset of this sock used yarn over increases on alternate rows. 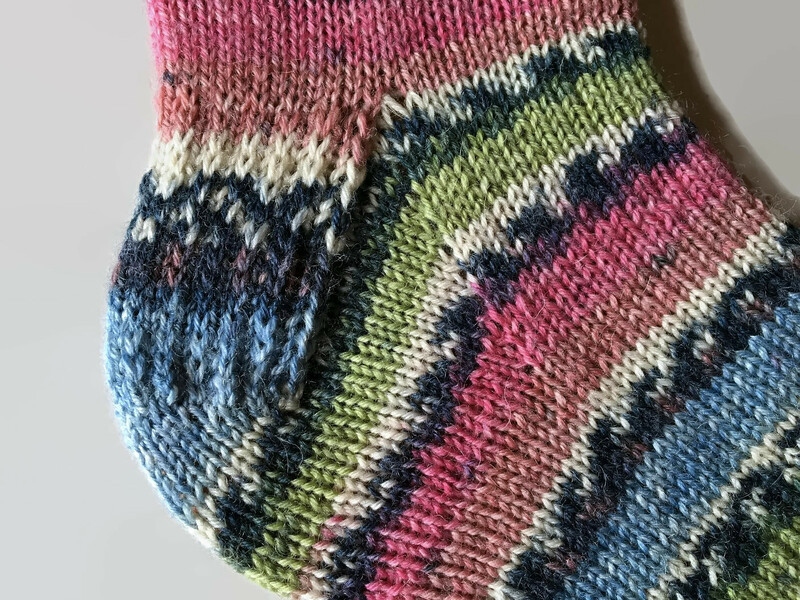 I’m a bit embarrassed that it took me until February to wonder if yarn over increases would also work for the gusset increases, another part of the sock that requires increases only on alternate rows. I couldn’t think of any reason why it wouldn’t, so decided to give it a go. It works just as well on the gusset as it does on the toe. No more squinting at my knitting, or counting rows up from the progress keeper; I can tell at a glance if I need to increase. It also looks great.